Friends of the Earth Scotland has published new research showing that the Scottish Parliament’s pension fund has over £2 million invested in fossil fuels, and a further £1 million in arms and tobacco. The news was reported today in the Sunday Herald and the Ferret. Ask the Scottish Parliament Pension Scheme to clean up its act and introduce a robust policy to invest sustainably and divest from fossil fuels, arms and tobacco. Back moves to give pension fund members across Scotland more control over the way money is invested on their behalf. You can email your MSP using this new tool on our website. One of the worst companies on the Scottish Parliament fund’s books is UK-based mining company BHP Billiton. Samuel Arregoces is from the village of Tabaco, a community of small-scale farmers of African descent which was brutally evicted in 2001 to make way for expansion of the massive Cerrejon opencast coal mine, now jointly owned by BHP Billiton. Danilo Urrea, CENSAT (Friends of the Earth Colombia), campaigns to reform the Colombian governments mining policies. 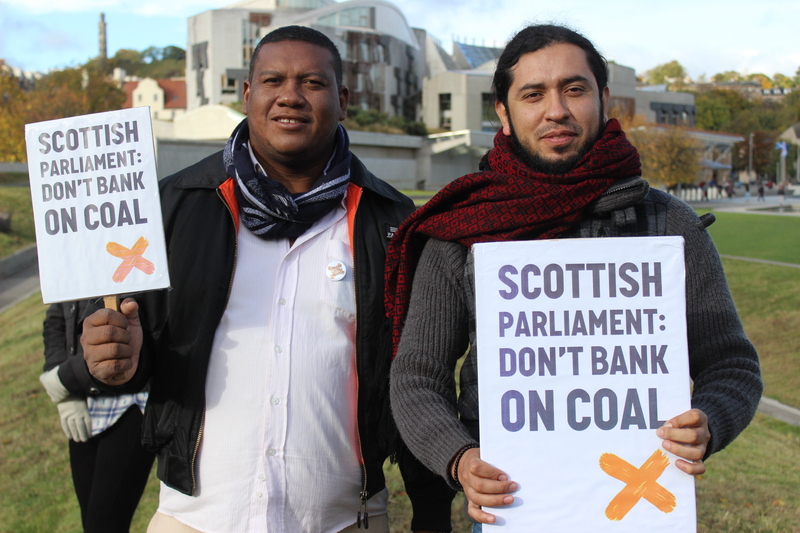 Danilo and Samuel (pictured, top) came to the Scottish Parliament to speak out about its investments in fossil fuels. Scotland has world-leading climate targets and will stop burning coal for electricity next year, an important milestone in cutting carbon emissions. But the Parliament pensions invest in companies like BHP Billiton, whose coal mines are destroying communities in a relentless drive to get more coal out of the ground. Pensions exist to sustain us for the future. MSPs should challenge their pension fund to invest in a future that’s worth living in. Last week the pension fund of the Environment Agency for England announced its intention to reduce its investments in fossil fuels. This follows similar action by the Norwegian Government pensions and the Universities of Glasgow and Edinburgh. 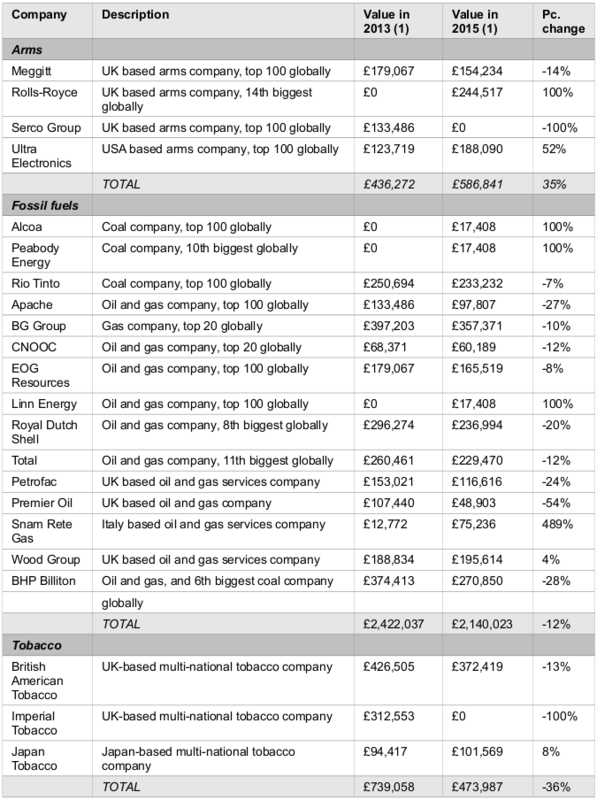 The Scottish Parliament Pension Fund also invests in tobacco companies who are attacking public health legislation – British American Tobacco and Japan Tobacco are currently taking the UK Government to court for revenues lost over the cigarette packaging ban and Rolls-Royce, who are involved in the replacement of Trident submarines. A complete analysis of the fund’s damaging investments is included below.